"My people, cleanse your wedding garments for truly they are soiled from your fornication with your other lovers. Think not that you will enter in your present condition with me into the Bridal Chambers. Turn away from your other lovers to me, your righteous, rightful Bridegroom who loves you and died for you. Think not that you will escape the judgments about to fall on this wicked, sinful world; you will not, for your actions have been found unworthy of me. Turn to me in sackcloth and ashes and I will receive you back unto myself, and forgive you and cleanse you from all your filth. I cannot bare to watch your incessant fornicating with your lovers. You enjoy it so! Why have you prostituted yourself? Have you lost your love for me? Yes, you have lost your first love. You have lost your desire to be with me, to commune with me, to spend time with me in the intimacy of my inner chamber. Return before it's too late! Repent, and cleanse yourself from your filthy wedding garments that you have defiled. They are not white anymore. Do you think I will take you as my bride in that condition? No, I will not! Hearken unto me, for I come very soon now with rewards for those who are worthy and have kept themselves pure for me. Great judgments are about to befall this world, the likes of which mankind has never seen before. Death will be everywhere, darkness and gloom. The wicked shall not escape. No matter where you make your bed, I will find you. Did you think that you could hide your evil deeds from me? I see everything; the good and the bad. I reward the good, and punish the evil. Some of you think that I am blind and deaf, and that I will never judge you for your evil? Verily, I say to you my judgment will be swift; but I will have mercy for the sake of my remnant, and allow you an opportunity to turn, repent and come to me in righteousness, purity and true love. Those who honor and love me will see my glory. The greatest harvest of souls the world has ever seen will take place because of it. I will do this, and you will get to see it with your own eyes, says the LORD." Revelation 3:11: "Behold, I come quickly: hold that fast which you have, that no man take your crown." Revelation 2:7: "He that has an ear, let him hear what the Spirit says unto the churches; To him that overcomes will I give to eat of the tree of life, which is in the midst of the paradise of God." Revelation 2:11: "He that has an ear, let him hear what the Spirit says unto the churches; He that overcomes shall not be hurt of the second death." Revelation 2:17: "He that has an ear, let him hear what the Spirit says unto the churches; To him that overcomes will I give to eat of the hidden manna, and will give him a white stone, and in the stone a new name written, which no man knows except him who receives it." Revelation 2:26-28: "And he that overcomes, and keeps my works unto the end, to him will I give power over the nations: And he shall rule them with a rod of iron; as the vessels of a potter shall they be broken to pieces: even as I received of my Father. And I will give him the morning star." Revelation 3:5: "He that overcomes, the same shall be clothed in white clothing; and I will not blot out his name out of the book of life, but I will confess his name before my Father, and before his angels." 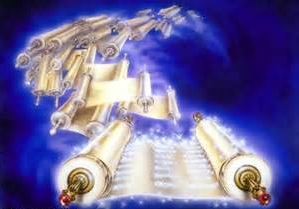 Revelation 3:12: "He that overcomes will I make a pillar in the temple of my God, and he shall go no more out: and I will write upon him the name of my God, and the name of the city of my God, which is new Jerusalem, which comes down out of heaven from my God: and I will write upon him my new name." Revelation 3:21: "To him that overcomes will I grant to sit with me in my throne, even as I also overcame, and sat down with my Father in his throne." Revelation 21:7: "He that overcometh shall inherit all things; and I will be his God, and he shall be my son."